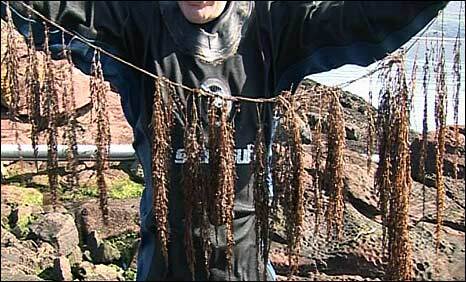 Experts have warned an alien seaweed which has invaded Scotland's west coast is spreading at an alarming rate. The Cumbrae-based University Marine Biological Research Station said Japanese wireweed could threaten the environment, fishing and fish farms. Found in the Pacific Ocean, the seaweed may have arrived in Scotland on international shipping. Within four years it has spread up the Scottish west coast to Skye in the Highlands. Dr Philip Smith, of the University Marine Research Station at Millport on the Firth of Clyde, said he was shocked at how quickly it had taken hold. He said: "This biological risk can out compete native species. "By growing so rapidly it can shade out those other species and compete more effectively for light." The "rubbery" wireweed - sargassum muticum - can grow as a mat and become entangled in fishing equipment and boat gear. In July, there were warnings that another Japanese seaweed could threaten the diversity of native species in Scottish waters. Heterosiphonia japonica was found by Dr Colin Moore while diving off the Isle of Oronsay, near Loch Sunart, in May. Since then, the academic from Heriot-Watt University in Edinburgh has found it in Glenmore Bay, Loch Sunart, Loch Drumbuie and Loch Creran. Conservationists believe the seaweed's rapid growth could potentially threaten other native species. Heterosiphonia japonica originates from the Pacific and can form dense tufts up to 30cm in length. It was first recorded in Europe in 1994, when it was spotted in oyster ponds in the Netherlands. Since then it has turned up in oyster farms in France and Spain and spread over much of the Norwegian coast. Dr Fiona Manson, marine advisory officer at Scottish Natural Heritage, said the discovery of the species had given rise to concern.